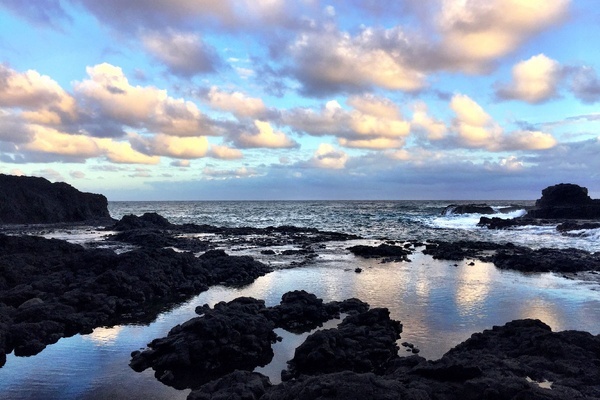 How to fully embrace the spirit of aloha? 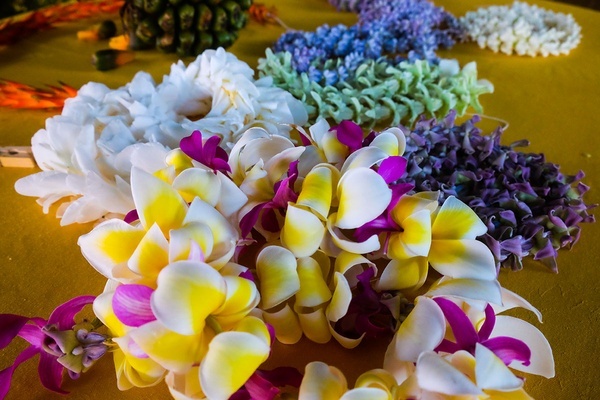 Start by hiking through wet jungles, sampling fresh taro, and methodically making your very own lei. KAUAI – A catamaran-style canoe named Hokule'a (ho-koo-lay-ah) is currently sailing across the world, guided only by the stars, spreading the message of malama honua. Malama honua means to care for and preserve everything that makes up our world: the people, land, oceans, living beings, and our community. Essentially, Hokule'a is on a voyage to spread a giant message of love — a message of compassion, peace, conservation, and communion with the earth and all who inhabit it. After spending some time on the island of Kauai, it became pretty evident that there is no better way to spread this message than to fill a canoe with Hawaiian Earth Ambassadors. The Hawaiian spirit is woven so deeply into the fabric of daily life that every vacation activity feels like some sort of island mantra. Surfing, sailing, and paddle-boarding become meditations in the ocean. Hiking, lei-making, and sustainable agriculture are exercises in preservation of the land. The view from Dragon's Breath. Anyone who goes hiking looks forward to a reward at the end, especially after hours of physical exertion. Kauai delivers on this in the most spectacular ways. The beautiful vistas are countless, the incredible waterfall-covered valleys are surreal, the canyons are stained with every shade and color of the earth — and are breathtaking. I spent my first morning in Kilauea, a small neighborhood on the northeastern shore. A local guide named Tab took me to a hidden spot appropriately nicknamed Dragon's Breath. After a short hike through a wet section of rocky jungle, we emerged on a stretch of ocean coast that felt like the edge of a volcano. The sky grew lighter as waves gently crashed on uneven black rock. The small waterfall behind us added a layer of Zen to an already serene and isolated view. Tab had been to this spot many times before, but he was still impressed with the beauty, and proud of it. As we spoke of other hikes on Kauai, he was clearly excited to show off his island. Later, I drove to nearby Waimea Canyon, known as the Grand Canyon of the Pacific. Experienced hikers can trek in and around it to access glorious vantage points inaccessible by car. Others can drive straight to a few lookouts to stare at the expanse as helicopters weave in and out of the magnificent gorge. The stunning cliffs along Na Pali Coast. Later that day, I drove up to Kee Beach to the most popular hike in Kauai: Kalalau Trail. The trail is a challenging eleven miles along the Na Pali coastline and down to its beaches. Few people do the whole trail — most hike up the first two miles and still get treated to stunning views after a fair bit of climbing and descending with some muddy and slippery terrain. 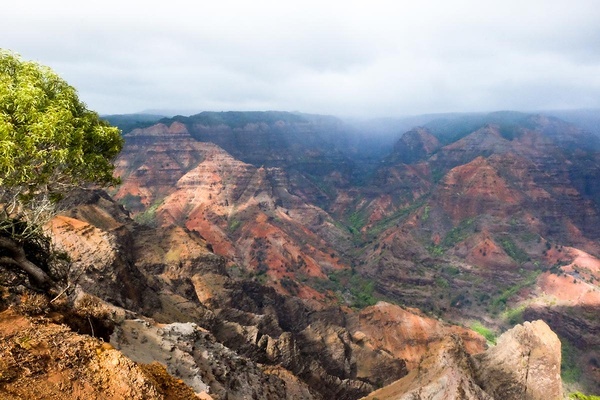 The coast is the most spectacular geological landscape Hawaii has to offer: This is why people come to Kauai. Most of the landmarks on the island can be accessed by a car ride and a short walk, but not the Na Pali. Its sheer, steep cliffs make access nearly impossible. I didn't hike the eleven-mile Kalalua Trail down to the beach, but I got to experience the coast while sailing on a catamaran. Next to a helicopter ride, sailing seems to be the best way to see it. Our sail started on the far northwest side of Kauai past Polihale State Park, a remote wild beach that's home to the best stargazing in the world. Most of the trip was easy, but once we made the turn around the northern tip of the island, the wind kicked up and became blustery, almost as if to tell us we were not wanted there. We had to earn our entry. Finally, as if granting us peaceful pass, the wind subsided and the captain killed the engine. The sails went up and we cruised along the most beautiful and majestic stretch of coastline I've ever seen in my life. Think Jurassic Park or Lost or Raiders of the Lost Ark. Jagged, steep cliffs covered in green, red, brown, and orange tickle the clouds and plummet thousands of feet straight down into the crystal blue ocean. Smooth waters at Hanalei Bay. 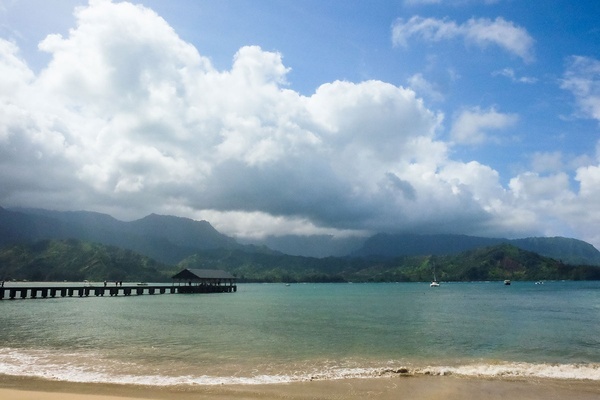 The place I enjoyed most on Kauai was Hanalei Bay on the North Shore. Hanalei feels liveable, as the sleepy beach town has a few decent restaurants, good food trucks, and a couple of great dive bars (my favorite was ). There's nothing that sticks out about the small neighborhood, and I like that about it. It's the quintessential coastal island suburb. The beach stretches for two miles, surrounded by ubiquitous mountains. The water is perfect — clear blue and warm. The locals say they have surf virtually year-round. That is remarkable. Surfing every day! Maybe I'll have to move. The bay is full of swimmers, surfers, and stand-up-paddleboarders, but doesn't feel crowded. Most days the waves are gentle but rolling, and I have yet to find a better place to paddle out. Until somewhat recently, before imports became more convenient, Hawaiians had to depend on their ’āina (land and resources, that which s us) to sustain their people, so cultivation and care were vital. The Hawaiian elders believe everyone shares the kuleana (responsibility) to be more sustainable. 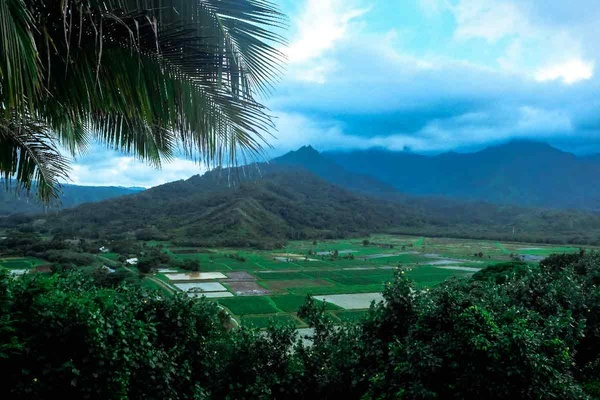 Hanalei Valley has a few organizations committed to the teaching and sharing the practices of farming and land preservation. 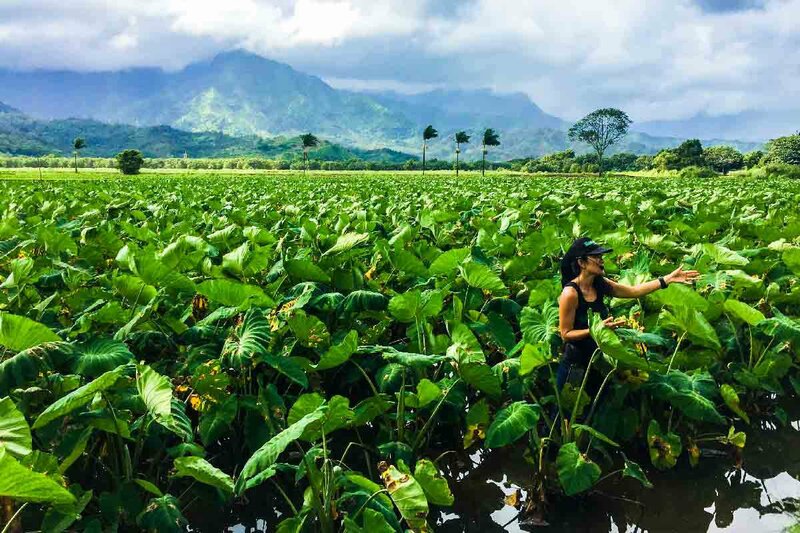 Hanalei Valley, a landmark in Kauai, is covered in private farmland and is off-limits to the public. The only way to step foot on the land is through a guided tour of , which sits on a sixth-generation , the largest in the state. Lyndsey Haraguchi-Nakayama, who still works the farm with her family, showed me around before giving me a taste of the starchy root. The most popular way to cook taro in these parts it as a creamy, purple-ish paste called poi. I didn't develop a taste for it, but it's no secret that the (owned by the Haraguchi family) serves the best on the island. It was clear that the farm is an enormous challenge to maintain. It is back-breaking, relentless work, and Mother Nature can throw a wrench into the harvest at any time. I asked Lyndsey why, with all the obstacles, she continues to do it. "My heart is with the plants," she said, "and I didn't want to be the generation that gave up." Just down the road at He 'Aina Ola Farm, the was started by a group of community elders who, like the Haraguchis, want to preserve the island's resources through a connection to the earth. Their goal is to teach the community how to connect with and sustain the land and culture by working together. The foundation offers educational farming programs for kids, hosts weekly local farmers' markets, and grows and distributes produce to the community. I and spoke with executive director Stacy Sproat-Beck, who told me "people who eat from the land they care for tend to feel very differently about it." Waipā is serious about taking responsibility to preserve the culture and teach their traditions to the new generations of Hawaiians. Aloha, indeed. One of the last activities on my trip was something I didn't want to do. I was invited to a lei-making workshop at the . The thought of spending two hours making floral neckwear instead of swimming or hiking or surfing was discouraging. But by then I should have known better than to judge something before I experienced it. The teacher, Noelani Pomroy, was one of the nicest and most gentle people I've ever met in my life. She married Paul Pomroy, whose parents, Walter and Irmalee, started their namesake annual lei-making contest in 1980 at the Kauai Musuem. Irmalee taught Noelani the tradition, and she has carried the torch. She had me make kui lei by piercing a needle through the center of a flower and stringing it onto thread. Simple. Soothing. I don't think I'll quit my job and go into floral design, but I spent a lovely afternoon with Noelani hearing about the tradition and why the custom is important to preserve. Many Hawaiian women are taught lei-making at an early age. Leis are given for graduations, weddings, and birthdays. They've become ubiquitous in Hawaiian culture, but their significance is important. They are given and worn as a form of honor, a symbol of love, peace, and friendship. Also, they're quite beautiful. I can't think of anything in American culture that carries the same significance. After I finished my lei and considered who to share it with, I thought about the one given to me at the airport by a beautiful Hawaiian woman. I was exhausted, cranky, and not really paying attention. But this woman met me with a bright smile and placed the lei around my neck. The custom didn't strike me as anything more than a routine gesture, which maybe it was. But after spending time in Kauai, I realize that it's one more expression of malama honua. One more statement of aloha. The view from Kalalua Trail. It's clear why people find Hawaii so romantic and why so many honeymooners choose Kauai in particular. But I think many of them miss the point. There's a reason why Hawaii is so seductive. There's a reason why so many people leave the mainland and relocate here permanently. Of course, part of it has to do with the island beauty and the weather. But the culture and the essence and spirit of the people are enchanting, as is the idea of caring for the land, the oceans, and one another. The message is universal. And now, more than ever, we need to be reminded of that. I was told that the Spirit of Aloha is not something that can be written about. It's only something that can be felt. And though I tried to articulate it here, the words are like the photographs: They don't do it justice. You'll just have to go see for yourself. 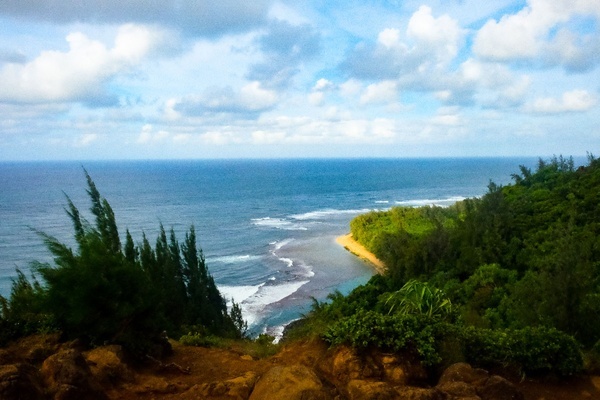 Hiking on Kauai: Ask for Tab Matsumoto at , or Jeremiah Felsen from . Surfing in Hanalei Bay: Ask for Little Mitch from to be your instructor. 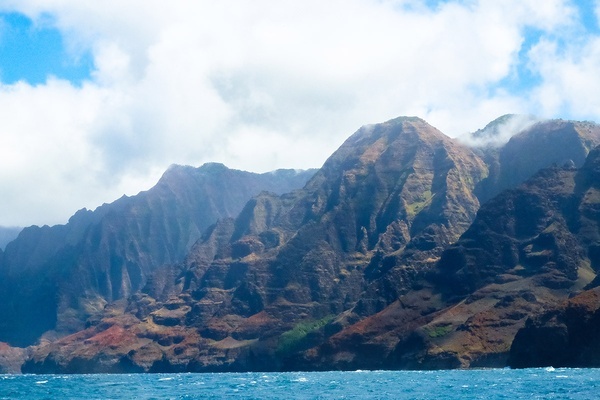 Sail the NaPali Coast with . Rob is a filmmaker in NYC. You can follow him on and and see his work on his . He travels for the escape.